Captain Hannah Billingham is targeting further success for champions Cardiff Met in this season's Women's Welsh Premier League. Cardiff Met claimed the domestic treble and won their first ever game in the Champions League during the summer, beating Athletico Ouriense of Portugal. Met begin the defence of their title at newly promoted Cwmbran Celtic. "We played really well last year and hope to build on that during this campaign," Billingham said. "We learned a lot out in the Champions League matches and hope that we can implement those lessons in the Welsh Premier this season." The new season, which begins on 7 September, was launched by representatives of the 12 member clubs during half-time of Wales' World Cup qualifier against England at Cardiff City Stadium. In addition to Cwmbran Celtic, Rhyl & Prestatyn Ladies have also been promoted to the Premier League and face Aberystwyth in their opening game. Llandudno Junction will now be based at the new 3G facility at Maesdu Park and have adopted the name Llandudno Ladies. 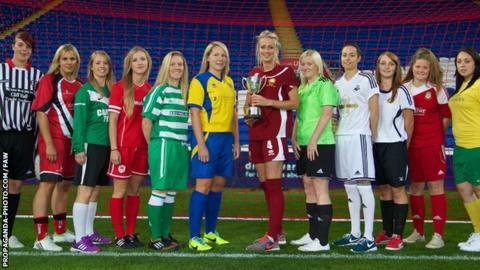 Llanidloes, last season's League Cup runners-up, will now be called Hafren United Ladies FC. "All of the girls can't wait to get started and playing Met in our first game will give us an early indication of how we'll do during the season," Randall said. "We're really looking forward to the campaign and hope to create a favourable impression on the League."